Part of my plans for the yard this year included adding flowers around the new chicken yard. 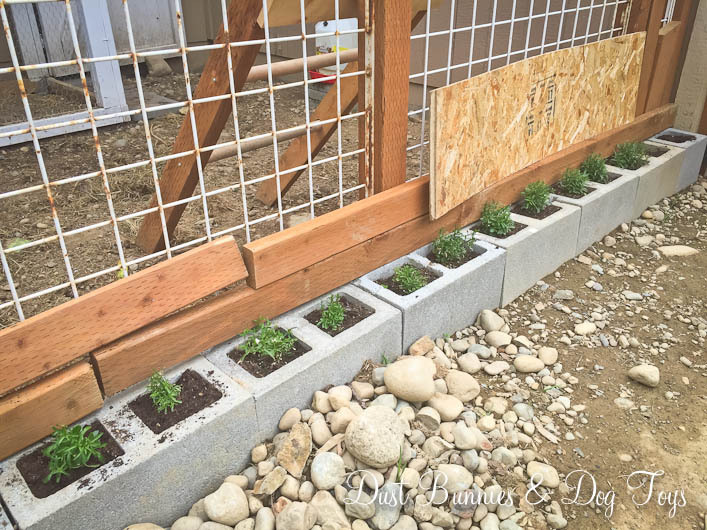 I placed cinderblocks around both sides of the yard so I’d have a built in row of planting spots and picked up a couple flats of lobelia at the nursery just for this area. Tequila stood chicken watch while I planted. Things were looking so pretty that even the hubs commented on the new flowers and I was feeling pretty happy with the project. That is until those fluffy cluckers attacked said flowers and had picked them down to the base before I finished planting the other side! I quickly placed boards against the fence so the chickens couldn’t see or reach the plants anymore in a desperate attempt to save those that had been hacked. But this was NOT the look I was going for. The hodge podge of boards constantly got knocked over and landed on the plants themselves which was just as damaging as the chickens pecking them. So what’s a chicken momma to do? 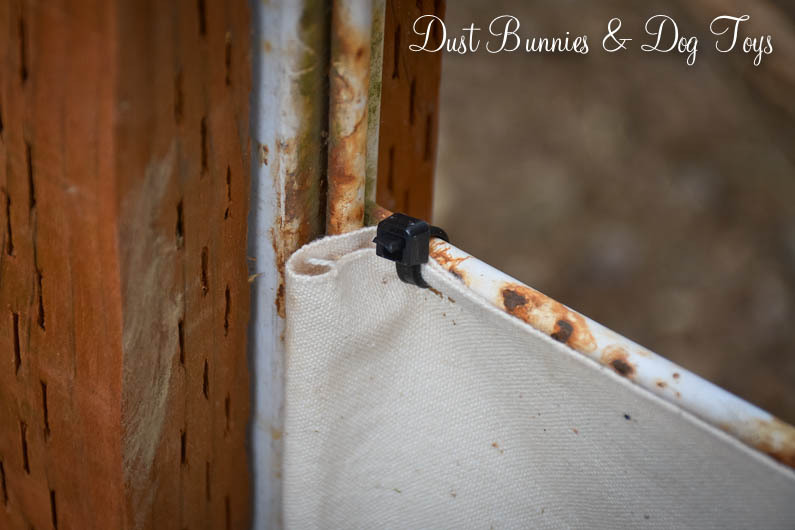 Well a crafty chicken momma makes protective curtains! I dug out some thick sail cloth material I had in my fabric stash and cut it to size to fit between each of the posts. A couple of simple slits along the top gave me a spot to use a zip tie to attach it to the panel and keep things taunt. It’s not the fanciest option, but it looks and works better than the piled high boards. And it didn’t cost me a cent! 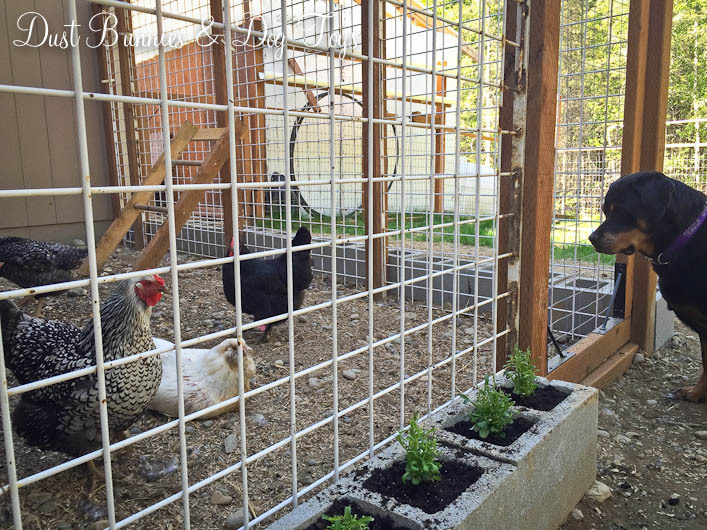 The curtains are just low enough that the chickens can still see out when standing on the ground and just high enough that Brinley can’t see in unless she stands on the blocks. She can still see through the door so that’s become her new viewing spot, which keeps her out of the plants as well. I did have to replace a few of the plants, but now things are looking pretty good. 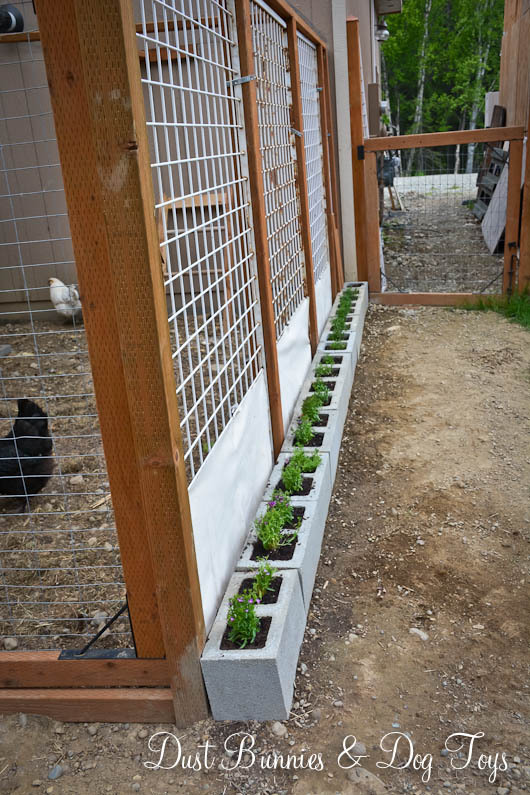 I didn’t make a curtain for the small panel at the back, since those two blocks will hold grass that I’ll let grow just for the hens. They are temporarily blocked with two small boards, but once they establish I’ll take them down periodically so they can enjoy fresh greens. I also got the walkway along the chicken yard cleared of the rock piles that had been there (hint, those are being used for another project that I’ll share soon). We’d like to put down pavers or some other permanent pathway from the deck to the gate, but that’s probably a project that will happen next season. For now having a clear established walkway functions just fine. I’m sure the chickens don’t appreciate my crafty genius solution, but that’s ok. I plan to take the curtains down at the end of the season and let the cluckers have at the remains of the plants since they are annuals anyway. Then I’ll wash the fabric and store it away for next year. 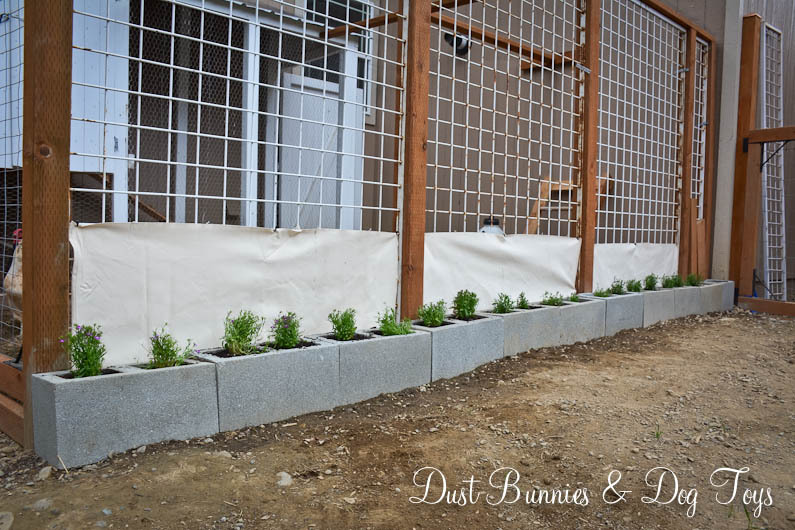 I’d love to hear what you think of my little project to pretty up this utilitarian space in our yard, so leave a comment below! So pretty! I have a question for you. What kind of wire is that that you used for the run? I’m planning on building a larger run and coop for my flock (kind of got too many, oops!) and I hate that hardware cloth is so expensive. Lots of people say it’s the only way to go to keep predators out, but I was looking at a wire similar to yours. 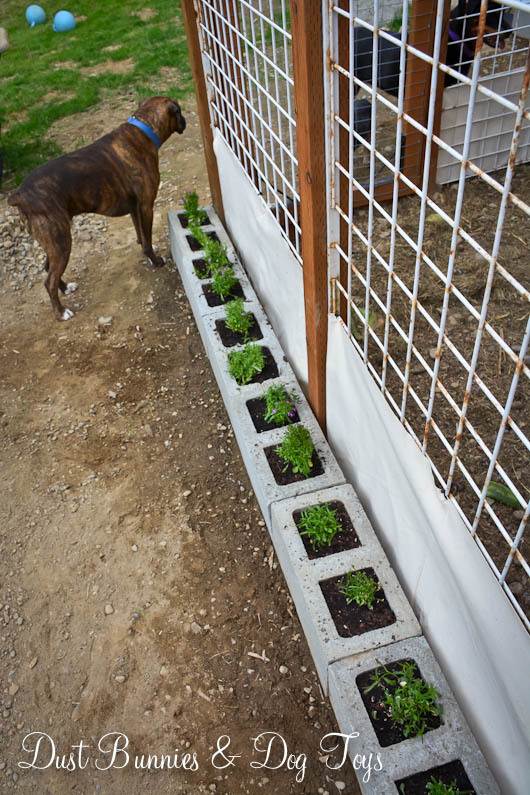 Much cheaper and prettier in my opinion, and seems sturdy enough to keep daytime critters away. Have you had any issues with predators trying to get in? Thanks! Those are actually metal panels that I found for free on Craigslist. 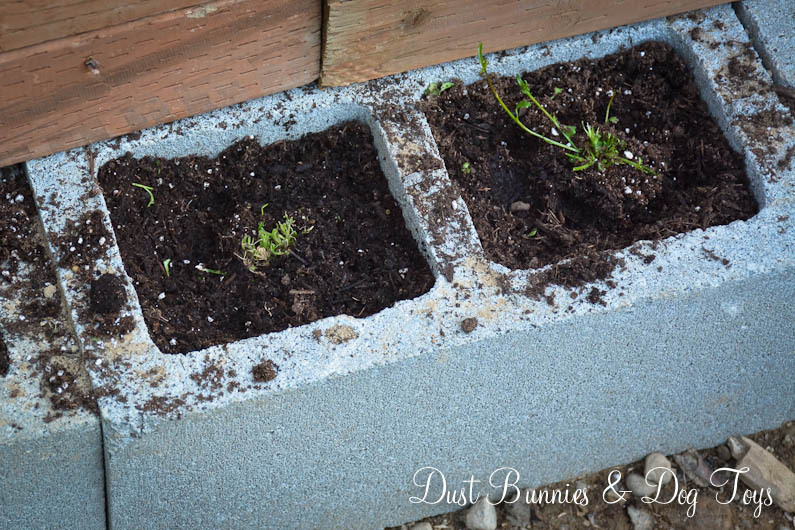 You can see pictures of them as we found them and how we put the run together using concrete footers and 4×4 posts if you click the link in the first line of this post. We haven’t had any issues with predators since this is inside our fenced in back yard which keeps our 3 large dogs near the house. So double fencing, protective pups and concrete footers have us pretty certain that nothing is getting in or out of this yard. 🙂 Good luck with your chicken yard!